Dust and water-resistant: IP54 rated. Rugged: 3-meter (9.8-foot) drop tested. Ergonomically designed: Completely redesigned for a more natural hand fit. Dual lasers: Identifies area to be measured. Large, backlit display: Makes data easier to read, even in dark areas. 3 forms of AC/DC voltage detection: light, sound, and vibration. Extra heavy-duty, replaceable test leads. CAT IV 600, CAT III 1000 V safety rated. Voltbeat™ technology and continuous self-test, so always know it’s working. Upon detection of voltage, tip glows and beeper sounds. Voltage detection of 90 to 1000 VAC. CAT IV 1000 V for added protection. Lightweight soft case to provide optimal protection and accessory storage. 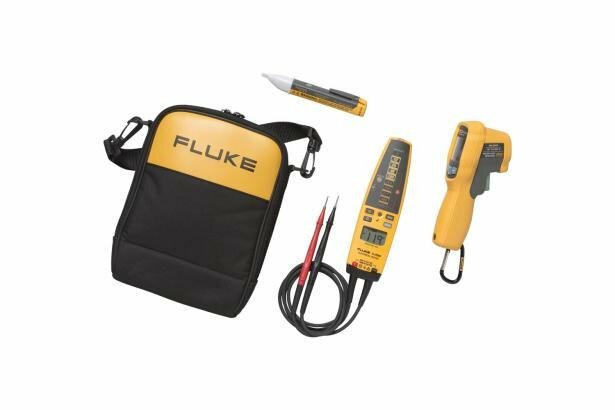 The rugged Fluke 62 MAX+ IR thermometer teamed with the full featured T+PRO voltage continuity tester and the easy-to-use 1-AC-II non-contact voltage detector, has everything you need to solve problems quickly. Use the IR thermometer to test for overheating in electrical devices, next use the electrical test tools to learn more about the problem safely and conveniently. 1. When used properly per Article 110.9 Use of Equipment (A) Test Instruments and Equipment. Operating principle Senses the steady state electrostatic ﬁeld produced by ac voltage through insulation without requiring contact to the bare conductor. A red glow at the tip and a beeping noise (if not switched OFF) indicates the presence of voltage. Product does not respond to random electrostatic discharge.